Some organisms use rolling as a means of locomotion. These examples do not constitute the use of a wheel, as the organism rotates as a whole, rather than employing separate parts which rotate independently. Several species of elongate organisms form their bodies into a loop to roll, including certain caterpillars (which do so to escape danger), tiger beetle larvae, myriapods, mantis shrimp, Armadillidiidae, and Mount Lyell salamanders. Other species adopt more spherical postures, primarily to protect their bodies from predators; this posture has been seen in pangolins, wheel spiders, hedgehogs, armadillos, Armadillo girdled lizards, isopods, and fossilized trilobites. Pangolins and wheel spiders have been observed to purposely roll away from predators. These species may roll passively (under the influence of gravity or wind) or actively, typically by altering their shape to generate a propulsive force. Tumbleweeds, which are the above-ground portions of certain plants, separate from their root structure and roll in the wind to distribute their seeds. These plants are found especially in open plain environments. The most well-known of these include Kali tragus (also known as Salsola tragus), or prickly Russian thistle, which arrived in North America in the late 19th century, and gained a reputation as a noxious weed. Fungi of the genus Bovista are known to use the same strategy to disperse their spores. Rotifers are a phylum of microscopic but multi-celled animals, typically found in freshwater environments. Although the Latin name rotifer means 'wheel-bearer', these organisms do not have any rotating structures, but rather a ring of rhythmically beating cilia used for feeding and propulsion. Keratinocytes, a type of skin cell, migrate with a rolling motion during the process of wound healing. These cells serve to form a barrier against pathogens and moisture loss through wounded tissue. Dung beetles form spherical balls of animal excrement, which they roll with their bodies, generally by walking backwards and pushing the ball with their rear legs. Phylogenetic analysis indicates that this rolling behavior evolved independently several times. The behavior of these beetles was noted in ancient Egyptian culture, which imparted sacred significance to their activities. Although it is the dung ball that rolls rather than the beetle itself, the beetles face many of the same mechanical difficulties that rolling organisms contend with. Among animals, there exists a single known example of an apparently freely-rotating structure, though it is used for digestion rather than propulsion: the crystalline style of certain bivalves and gastropods. :89 The style consists of a transparent glycoprotein rod which is continuously formed in a cilia-lined sac and extends into the stomach. The cilia rotate the rod, so that it becomes wrapped in strands of mucus. As the rod slowly dissolves in the stomach, it releases digestive enzymes. Estimates of the speed of rotation of the style in vivo vary significantly, and it is unclear if the style is rotated continuously or intermittently. There are two known examples of molecular-scale rotating structures used by living cells. ATP synthase is an enzyme used in the process of energy storage and transfer. It bears some similarity to the flagellar motors discussed below. ATP synthase is thought to have arisen by modular evolution, in which two subunits with their own functions have become associated and gained a new functionality. The only known example of a biological "wheel"—a system capable of providing continuous propulsive torque about a fixed body—is the flagellum, a corkscrew-like tail used by single-celled prokaryotes for propulsion. :396 The bacterial flagellum is the best known example. About half of all known bacteria have at least one flagellum, indicating that rotation may in fact be the most common form of locomotion in living systems, though its use is restricted to the microscopic environment. At the base of the bacterial flagellum, where it enters the cell membrane, a motor protein acts as a rotary engine. The engine is powered by proton motive force, i.e. by the flow of protons (hydrogen ions) across the bacterial cell membrane due to a concentration gradient set up by the cell's metabolism. (In species of the genus Vibrio, there are two kinds of flagella, lateral and polar, and some are driven by a sodium ion pump rather than a proton pump.) Flagella are quite efficient, allowing bacteria to move at speeds of up to 60 cell lengths per second. The rotary motor at the base of the flagellum is similar in structure to ATP synthase. Spirillum bacteria have helical bodies with flagella at either end, and they spin about the central axis of their bodies as they move through the water. 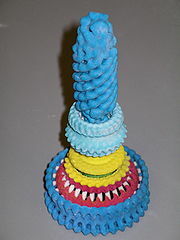 Archaea, a group of prokaryotes separate from bacteria, also feature flagella – known as archaella – driven by rotary motor proteins, which are structurally and evolutionarily distinct from bacterial flagella: whereas bacterial flagella evolved from the bacterial Type III secretion system, archaella appear to have evolved from type IV pili. Some eukaryotic cells, such as the protist Euglena, also have flagella, but eukaryotic flagella do not rotate at the base; rather, they bend in such a way that the tip of the flagellum whips in a circle. :1105 The eukaryotic flagellum, also called a cilium or undulipodium, is structurally and evolutionarily distinct from prokaryotic flagella. The absence of wheels in nature is frequently attributed to constraints imposed by biology: natural selection constrains the evolutionary paths available to species, and the processes by which multicellular organisms grow and develop may not permit the construction of a functioning wheel. Illustration of a fitness landscape, indicating genetic flow of populations toward local optima. Potentially beneficial changes requiring descent into a fitness "valley" are foreclosed by natural selection. The processes of evolution, as they are presently understood, can help explain why wheeled locomotion has not evolved in multicellular organisms: simply put, a complex structure or system will not evolve if its incomplete form provides no benefit to the organism. Natural selection therefore explains why wheels are an unlikely solution to the problem of locomotion: a partially evolved wheel, missing one or more key components, would probably not impart an advantage to an organism. The exception to this is the flagellum, the only known example of a freely rotating propulsive system in biology; in the evolution of flagella, individual components were recruited from older structures, where they performed tasks unrelated to propulsion. The basal body that is now the rotary motor, for instance, might have evolved from a structure used by the bacterium to inject toxins into other cells. This recruitment of previously evolved structures to serve new functions is called exaptation. Molecular biologist Robin Holliday has written that the absence of biological wheels argues against creationist or intelligent design accounts of the diversity of life, because an intelligent creator—free of the limitations imposed by evolution—would be expected to deploy wheels wherever they would be of use. The greatest anatomical impediment to wheeled multicellular organisms is the interface between the static and rotating components of the wheel. In either a passive or driven case, the wheel (and possibly axle) must be able to rotate freely relative to the rest of the machine or organism. [Note 2] Unlike animal joints, which have a limited range of motion, a wheel must be able to rotate through an arbitrary angle without ever needing to be "unwound". As such, a wheel cannot be permanently attached to the axle or shaft about which it rotates (or, if the axle and wheel are fixed together, the axle cannot be affixed to the rest of the machine or organism). :44 There are several functional problems created by this requirement, though these may be partly surmountable. In the case of a driven wheel, a torque must be applied to generate the locomotive force. In human technology, this torque is generally provided by a motor, of which there are many types, including electric, piston-driven, turbine-driven, pneumatic, and hydraulic. (Torque may also be provided by human power, as in the case of a bicycle.) In animals, motion is typically achieved by the use of skeletal muscles, which derive their energy from the metabolism of nutrients from food. :406 Because these muscles are attached to both of the components that must move relative to each other, they are not capable of directly driving a wheel. In addition, large animals cannot produce high accelerations, as inertia increases rapidly with body size. Reducing friction is vital for minimizing wear on mechanical components and preventing overheating. :1 As the relative speed of the components rises, and as the contact force between them increases, the importance of friction mitigation increases. :2–3 Various types of bearing and/or lubricant may be used to reduce friction at the interface between two components. In biological joints such as the human knee, friction is reduced by means of cartilage with a very low friction coefficient, as well as lubricating synovial fluid, which has very low viscosity. Gerhard Scholtz of Humboldt University of Berlin asserts that a similar secreted lubricant or dead cellular material could allow a biological wheel to rotate freely. Another potential problem that arises at the interface between wheel and axle (or axle and body) is the limited ability of an organism to transfer materials across this interface. If the tissues that make up a wheel are living, they will need to be supplied with oxygen and nutrients and have wastes removed to sustain metabolism. A typical animal circulatory system, composed of blood vessels, would not be able to provide transportation across the interface. :405 In the absence of circulation, oxygen and nutrients would need to diffuse across the interface, a process that would be greatly limited by the available partial pressure and surface area, in accordance with Fick's law of diffusion. :48 For large multicellular animals, diffusion would be insufficient. Alternatively, a wheel could be composed of excreted, nonliving material such as keratin, of which hair and nails are composed. Wheels incur mechanical and other disadvantages in certain environments and situations that would represent a decreased fitness when compared with limbed locomotion. These disadvantages suggest that, even barring the biological constraints discussed above, the absence of wheels in multicellular life may not be the "missed opportunity" of biology that it first seems. In fact, given the mechanical disadvantages and restricted usefulness of wheels when compared with limbs, the central question can be reversed: not "Why does nature not produce wheels? ", but rather, "Why do human vehicles not make more use of limbs?" The use of wheels rather than limbs in most engineered vehicles can likely be attributed to the complexity of design required to construct and control limbs, rather than to a consistent functional advantage of wheels over limbs. Although stiff wheels are more energy efficient than other means of locomotion when traveling over hard, level terrain (such as paved roads), wheels are not especially efficient on soft terrain such as soil, because they are vulnerable to rolling resistance. In rolling resistance, a vehicle loses energy to the deformation of its wheels and the surface on which they are rolling. Smaller wheels are especially susceptible to this effect. :401 Softer surfaces deform more and recover less than firm surfaces, resulting in greater resistance. Rolling resistance on medium to hard soil can be five to eight times greater than on concrete, and on sand it can be ten to fifteen times greater. While wheels must deform the surface along their entire path, limbs induce only a small, localized deformation around the region of foot contact. Rolling resistance is also the reason at least one historical human civilization abandoned the use of wheels. During the time of the Roman Empire, wheeled chariots were common in the Middle East and North Africa; yet when the Empire collapsed and its roads fell into disrepair, wheels fell out of favor with the local populations, who turned to camels to transport goods in the sandy desert climate. In his book Hen's Teeth and Horse's Toes, Stephen Jay Gould explains this curiosity of history, asserting that, in the absence of maintained roads, camels required less manpower and water than a cart pulled by oxen. A mountain goat navigating a rocky landscape. Mountain goats illustrate the versatility of legs in challenging terrain. Work by engineer Mieczysław G. Bekker implies that the distribution of irregularities in natural terrains is log-normal; that is, small obstacles are far more common than larger ones. Thus, obstacle navigation presents a challenge to locomotion in natural terrains at all size scales. :400–401 The primary means of obstacle navigation on land are to go around obstacles and to go over them; each has its attendant challenges. Anatomist Michael LaBarbera of the University of Chicago illustrates the poor maneuverability of wheels by comparing the turning radii of walking and wheelchair-using humans. :402 As Jared Diamond points out, most biological examples of rolling are found in wide open, hard packed terrain, including the use of rolling by dung beetles and tumbleweeds. With unarticulated wheels, climbing obstacles will cause the body of a vehicle to tilt. If the vehicle's center of mass moves outside of the wheelbase or axle track, the vehicle becomes statically unstable, and will tend to tip over. At speed, a vehicle can become dynamically unstable, meaning that it can be tipped over by an obstacle smaller than its static stability limit, or by excessive acceleration or tight turning. Without articulation, this can be an impossible position from which to recover. Legends and speculative fiction reveal a longstanding human fascination with rolling and wheeled creatures. Such creatures appear in mythologies from Europe, Japan, pre-Columbian Mexico, the United States, and Australia. The hoop snake, a creature of legend in the United States and Australia, is said to grasp its tail in its mouth and roll like a wheel towards its prey. Japanese culture includes a similar mythical creature, the Tsuchinoko. 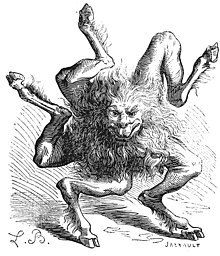 Buer, a demon mentioned in the 16th-century grimoire Pseudomonarchia Daemonum, was described and illustrated in Collin de Plancy's Dictionnaire Infernal as having radially-arranged arms on which it rolled. The Dutch graphic artist M. C. Escher illustrated a rolling creature of his own invention in a 1951 lithograph. Rolling creatures are also featured in works written by comic author Carl Barks, science fiction writers Fredric Brown, George R. R. Martin, and Joan Slonczewski, and in the Sonic the Hedgehog video game series, which first appeared in 1991. Toy animals with wheels dating from the Pre-Columbian era were uncovered by archaeologists in Veracruz, Mexico, in the 1940s. The indigenous peoples of this region did not use wheels for transportation prior to the arrival of Europeans. Several twentieth-century writers explored possibilities of wheeled creatures. L. Frank Baum's 1907 children's novel Ozma of Oz features humanoid creatures with wheels instead of hands and feet, called Wheelers. Their wheels are composed of keratin, which has been suggested by biologists as a means of avoiding nutrient and waste transfer problems with living wheels. Despite moving quickly on firm open terrain, the Wheelers cannot cross sand, and are stymied by obstacles in their path that do not hinder creatures with limbs. In the latter half of the twentieth century, wheeled or wheel-using creatures featured in works by fantasy and science fiction writers including Clifford D. Simak, Piers Anthony, David Brin, K. A. Applegate, Philip Pullman, and writing partners Ian Stewart and Jack Cohen. Some of these works address the developmental and biomechanical constraints on wheeled creatures: Brin's creatures suffer from arthritic axles,:109 and Pullman's Mulefa are not born with wheels, but roll on seed pods with which they coevolved. ^ Although evolutionary and developmental constraints may preclude the possibility of a wheel as part of an organism, they do not preclude the use of foreign objects as "wheels", either instinctively (as in the case of the dung beetles discussed above), or through intelligently directed tool use (as in human technology). ^ Wheels can be considered to fall into two types: passive and driven. A passive wheel simply rolls freely over a surface, reducing friction when compared with dragging. A driven wheel is powered, and transmits energy to the surface to generate forward motion. ^ a b c Gambino, Megan (June 17, 2009). "A Salute to the Wheel". Smithsonian. Archived from the original on June 26, 2017. ^ a b Kruszelnicki, Karl S. (August 9, 1999). "Real Wheel Animals—Part Two". Great Moments in Science. ABC Science. Archived from the original on October 1, 2016. ^ "Wheel". Merriam-Webster. Encyclopædia Britannica. Retrieved September 16, 2011. ^ a b c d e f g h i Scholtz, Gerhard (2008). "Scarab Beetles at the Interface of Wheel Invention in Nature and Culture?". Contributions to Zoology. 77 (3). ISSN 1875-9866. Archived from the original on October 21, 2016. ^ Ganong, William F. (1921). "The dissemination and dispersal of plants". A Textbook of Botany for Colleges, Parts 1–2. Macmillan. p. 359. ISBN 978-1-363-99934-7 – via Google Books. ^ "Salsola tragus". Natural Resources Conservation Service PLANTS Database. USDA. Retrieved 28 October 2015. ^ Main, Douglas (2011-03-02). "Consider the Tumbleweed". scienceline.org. Archived from the original on June 25, 2017. ^ Miller, H. H.; Miller, O. K. (1988). Gasteromycetes: Morphological and Developmental Features, with Keys to the Orders, Families, and Genera. Mad River Press. p. 19. ISBN 978-0-916422-74-5. ^ Howey, Richard L. (November 1999). "Welcome to the Wonderfully Weird World of Rotifers". Microscopy UK. Archived from the original on August 4, 2012. ^ Pechenik, Jan A. (2005). Biology of the Invertebrates. McGraw-Hill, Higher Education. p. 178. ISBN 978-0-07-234899-6. ^ Anderson, K.I. ; Wang, Y.L. ; Small, J.V. (September 1996). "Coordination of Protrusion and Translocation of the Keratocyte Involves Rolling of the Cell Body". Journal of Cell Biology. 134 (5): 1209–1218. doi:10.1083/jcb.134.5.1209. PMC 2120980. PMID 8794862. ^ "Creative Bioarray Released A Series of Products on Keratinocyte". ABNewswire. April 19, 2017. Archived from the original on August 23, 2017. ^ a b Owen, Jennifer (1980). "Filter-feeding". Feeding Strategy. University of Chicago Press. p. 89. ISBN 978-0-226-64186-7. ^ a b Oster, George; Wang, Hongyun (March 2003). "Rotary Protein Motors". Trends in Cell Biology. 13 (3): 114–121. doi:10.1016/S0962-8924(03)00004-7. PMID 12628343. ^ Feniouk, Boris A. "ATP Synthase FAQ". ATP Synthase—A Splendid Molecular Machine. Boris A. Feniouk. Archived from the original on September 15, 2016. ^ Crofts, Anthony (1996). "Lecture 10: ATP Synthase". Biophysics 354: Biological Energy Conversion. University of Illinois at Urbana-Champaign. Archived from the original on September 15, 2016. ^ Falk, Gunnar; Walker, John E. (1988). "DNA Sequence of a Gene Cluster Coding for Subunits of the F0 Membrane Sector of ATP Synthase in Rhodospirillum rubrum. Support for Modular Evolution of the F1 and F0 Sectors". Biochemical Journal. 254 (1): 109–122. doi:10.1042/bj2540109. PMC 1135046. PMID 2902844. ^ Gebremichael, Yeshitila; Ayton, Gary S.; Voth, Gregory A. (November 2006). "Mesoscopic Modeling of Bacterial Flagellar Microhydrodynamics". Biophysical Journal. 91 (10): 3640–3652. Bibcode:2006BpJ....91.3640G. doi:10.1529/biophysj.106.091314. PMC 1630491. PMID 16935949. ^ Goldsworthy, Andrew (2005). "Pre-inventing the Wheel". In O'Hare, Mick; New Scientist (eds.). Does Anything Eat Wasps? And 101 Other Questions. Profile Books. p. 182. ISBN 978-1-86197-835-6. OCLC 61757621. ^ Franklin, James (Nov 1, 2009). "The Complexity Obstacle to Knowledge". What Science Knows: And How It Knows It. Encounter Books. p. 227. ISBN 978-1-59403-439-8 – via Google Books. ^ Chwang, A.T.; Wu, T.Y. ; Winet, H. (November 1972). "Locomotion of Spirilla". Biophysical Journal. 12 (11): 1549–1561. Bibcode:1972BpJ....12.1549C. doi:10.1016/S0006-3495(72)86181-2. ISSN 1542-0086. PMC 1484193. PMID 4642227. ^ Moran, Jonathan; McKean, Paul G.; Ginger, Michael L. (November 25, 2014). "Eukaryotic Flagella: Variations in Form, Function, and Composition During Evolution". BioScience. 64 (12): 1103–1114. doi:10.1093/biosci/biu175. Archived from the original on April 13, 2017. ^ Mitchell, David R. (2007). The Evolution of Eukaryotic Cilia and Flagella as Motile and Sensory Organelles. Advances in Experimental Medicine and Biology. 607. pp. 130–140. doi:10.1007/978-0-387-74021-8_11. ISBN 978-0-387-74020-1. PMC 3322410. PMID 17977465. ^ a b c d e f g Dawkins, Richard (November 24, 1996). "Why Don't Animals Have Wheels?". Sunday Times. Archived from the original on February 21, 2007. ^ a b c d e Gould, Stephen Jay (1981). "Kingdoms Without Wheels". Natural History. 90 (3): 42–48. ISSN 0028-0712. ^ Kimura, Motoo (1991). "The Neutral Theory of Molecular Evolution: A Review of Recent Evidence". Japanese Journal of Genetics. 66 (4): 367–386. doi:10.1266/jjg.66.367. PMID 1954033. ^ Otto, Sarah P.; Whitlock, Michael C. (1997). "The Probability of Fixation in Populations of Changing Size". Genetics. 146 (2): 723–733. PMC 1208011. PMID 9178020. ^ Matzke, Nicholas J. (2003). "Evolution in (Brownian) Space: A Model for the Origin of the Bacterial Flagellum". TalkOrigins.org. Archived from the original on September 19, 2016. ^ Matzke, Nicholas J. (September 7, 2006). "Flagellum Evolution in Nature Reviews Microbiology". The Panda's Thumb. Archived from the original on April 16, 2016. ^ a b Fish, Frank E.; Lauder, George V.; Mittal, Rajat; Techet, Alexandra H.; Triantafyllou, Michael S.; Walker, Jeffery A.; Webb, Paul W. (June 8, 2003). "Conceptual Design for the Construction of a Biorobotic AUV Based on Biological Hydrodynamics" (PDF). George Washington University. Archived from the original (PDF) on August 20, 2010. ^ Bräunl, Thomas (September 10, 2008). "Driving Robots". Embedded Robotics: Mobile Robot Design and Applications with Embedded Systems. Springer Science & Business Media. pp. 131–132. ISBN 978-3-540-70533-8 – via Google Books. ^ a b Seireg, Shirley (September 1, 1998). Friction and Lubrication in Mechanical Design. CRC Press. pp. 1–3. ISBN 978-0-8493-0728-7 – via Google Books. ^ Scott, D.; Neale, M. J. (March 1, 1983). Jones, M. H.; Scott, D. (eds.). Industrial Tribology: The Practical Aspects of Friction, Lubrication and Wear. Elsevier. pp. 1, 31. ISBN 978-0-08-087572-9 – via Google Books. ^ Callaghan, John J. (2003). "Chapter 7: Biomechanics of the Articular Cartilage and Menisci of the Adult Knee". The Adult Knee, Volume 1. Lippincott Williams & Wilkins. pp. 97–98. ISBN 978-0-7817-3247-5 – via Google Books. ^ Full, Robert J. (February 2002). Robert Full on Engineering and Evolution (Conference presentation video). TED Conferences. Archived from the original on February 26, 2017. ^ Donat, Wolfram; Giles, Gretchen (December 5, 2014). "Robot Feet vs. Wheels: The Conundrum". Makezine.com. Archived from the original on March 27, 2016. ^ Todd, D. J. (March 8, 2013). "General Principles of Legged Locomotion". Walking Machines: An Introduction to Legged Robots. Springer Science & Business Media. pp. 41–43. ISBN 978-1-4684-6858-8 – via Google Books. ^ Lienhard, John H. "A Man with Wheels?". The Engines of Our Ingenuity. Episode 406. University of Houston. National Public Radio. KUHF-FM. Archived from the original on August 24, 2016. ^ Radhakrishnan, V. (May 12, 1998). "Locomotion: Dealing with Friction". PNAS. 95 (10): 5448–5455. Bibcode:1998PNAS...95.5448R. doi:10.1073/pnas.95.10.5448. PMC 20397. PMID 9576902. ^ "Tech Today: Walking Forest Machine". Space.com. Archived from the original on March 10, 2006. ^ a b Wong, Jo Yung (2008). Theory of Ground Vehicles. John Wiley and Sons. ISBN 978-0-470-17038-0 – via Google Books. ^ a b Nof, Shimon Y. (1999). "Mobile Robots and Walking Machines". Handbook of Industrial Robotics, Volume 1. John Wiley & Sons. ISBN 978-0-471-17783-8 – via Google Books. ^ a b Balasubramanian, Ravi (May 2004). "Legless Locomotion: Concept and Analysis". Carnegie Mellon University: 1. CiteSeerX 10.1.1.118.7949. ^ Transportation Research Board (2002). "Vehicle Dynamics". Special Report 265: The National Highway Traffic Safety Administration's Rating System for Rollover Resistance: An Assessment. National Academy of Sciences. ISBN 978-0-309-07249-6. LCCN 2002067171. Archived from the original on March 18, 2017. ^ Johnson, Raymond P. (June 1993). "Unstable Vehicles—Unsafe at Any Speed". Raymond Paul Johnson, a Law Corporation. Archived from the original on April 22, 2016. ^ a b de Plancy, Jacques-Albin-Simon Collin (1825). Dictionnaire Infernal (in French). P. Mongie aîné. p. 478. Retrieved 12 September 2016. ^ a b Pruett, Chris (November 2010). "The Anthropology of Fear: Learning About Japan Through Horror Games" (PDF). Interface on the Internet. Berglund Center for Internet Studies. 10 (9). Retrieved April 16, 2011. ^ de Plancy, Jacques-Albin-Simon Collin (1863). Henri Plon (ed.). Dictionnaire Infernal (in French). p. 123. ISBN 978-2-05-101277-5. Retrieved 12 September 2016. ^ Escher, Maurits Cornelis (2001). M.C. Escher, the Graphic Work. Taschen. pp. 14, 65. ISBN 978-3-8228-5864-6. ^ Andrae, Thomas (2009). "The Garden in the Machine". In Heer, Jeet; Worcester, Kent (eds.). A Comics Studies Reader. University Press of Mississippi. p. 278. ISBN 978-1-60473-109-5. ^ Brown, Fredric (1944). Arena. Astounding Stories. ISBN 978-963-523-497-4. Archived from the original on April 14, 2009. ^ Martin, George R.R. (1986). Tuf Voyaging. Baen Books. ISBN 978-0-671-55985-4. Archived from the original on June 3, 2016 – via Le Cercle Fantastique. ^ Switzer, David M. (March 11, 2014). "Microbe". The Science Fiction of Joan Slonczewski. Archived from the original on December 28, 2016. ^ Slonczewski, Joan (1998). Microbe. The Children Star. Tor Science Fiction. ISBN 978-0-312-86716-4. Archived from the original on April 17, 2016. ^ Sonic Team (June 23, 1991). Sonic the Hedgehog. Sega Genesis. Sega. ^ Thomas, Lucas M. (January 26, 2007). "Sonic the Hedgehog VC Review". IGN. IGN Entertainment. Archived from the original on January 13, 2016. ^ a b Baum, Lyman Frank (1907). Ozma of Oz. Oz. 3. John Rea Neill (illustrator). The Reilly & Britton Co. pp. 44–47. ISBN 978-1-173-24727-0 – via Google Books. ^ Simak, Clifford D. (1968). The Goblin Reservation. G. P. Putnam's Sons. pp. 5, 42. ISBN 978-0-88184-897-7. ^ Anthony, Piers (October 1977). Cluster. Avon Books. pp. 18–20, 143. ISBN 978-1-61756-013-2 – via Google Books. ^ a b Brin, David (1995). Brightness Reef. Uplift trilogy. 1. Random House. ISBN 978-0-553-57330-5 – via Google Books. ^ Applegate, K. A. (1997). The Andalite Chronicles. Animorphs. Scholastic Press. ISBN 978-0-590-10971-0. ^ a b Pullman, Philip (2000). The Amber Spyglass. His Dark Materials. 3. Alfred A. Knopf. ISBN 978-0-375-84673-1. ^ Stewart, Ian; Cohen, Jack (2000). Wheelers. Warner Books. ISBN 978-0-446-52560-2.